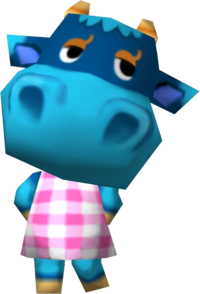 Bessie is a normal cow villager from the Animal Crossing series. Her name is derived from the popular cow name, "Bessie", while her Japanese name, Amore, means “lovely” in Italian, referencing the ”lovely” nature of normal villagers. Bessie is a blue cow with a lighter blue muzzle, arms and legs, and the tips of her ears are also that color. She has orange eyeshadow and a single orange eyelash on each eye. She has orange horns. Bessie's initial shirt is the pink gingham. Bessie is a normal villager, which means she is a sweet and naïve villager to hang around with. She will rarely get angry, although she will still become angered if pushed too far. She gets along well with most villagers, especially peppy and lazy villagers, the latter of which she will act towards as a motherly figure. This cow has a curious habit of sticking fruit up her nose. First it was little things like cherries and grapes. But lately, she's been trying oranges. What next? Cantaloupes? With all due respect, that girl's a real fruitcake! Modified on March 4, 2019, at 16:54.